We seem to be a family that's always on the go. A few months ago, I picked up a box of the Golden Grahams Treat bars so I would have something sweet to throw in my bag during a work trip. I really liked the bars, and when I saw they also had a Lucky Charms version, I knew I had to pick up a box of those as well to tempt my "breakfast-avoider" child in the mornings before school. When BlogSpark asked if I wanted to share some information about these bars, and host a giveaway, I couldn't say no! They were already in my pantry and I was happy to receive 2 more boxes. These cereal bars are a great snack to eat on the run, and paired with a piece of fruit -- I'm happy to see my oldest finally eat breakfast before heading out the door. The bars have less than 140 calories each, which makes them a good snack option, in my opinion. You can learn more about the treats at Betty Crocker's website, or on Betty Crocker's Facebook page. My boys were also excited to see that these boxes offer double box tops, since their school is currently running a contest to see which class can bring in the most box tops to raise funds for a stage curtain at the school. Betty Crocker and My Blog Spark have provided me with a fun back to school giveaway for one of my readers! 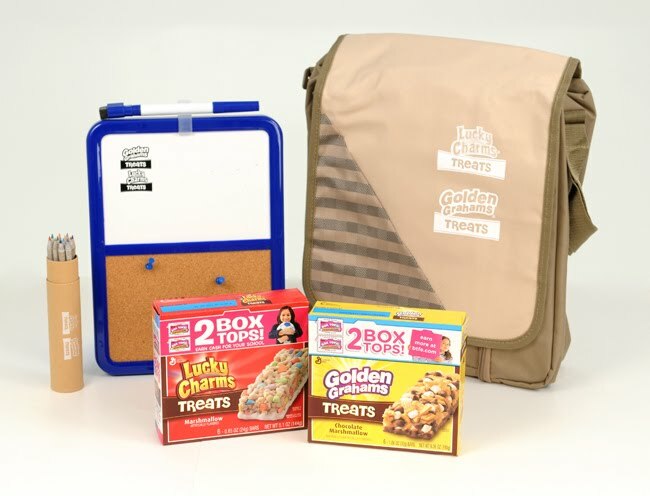 You could receive a box of the Lucky Charms cereal treat bars and a box of the Golden Grahams cereal treat bars, as well as a handy, insulated snack bag, set of watercolors and a message board. The picture at the top of this post is an example of what you will receive. Mandatory Question: What do you do to make the "back to school" season more fun? I will choose a winner on September 11, 2011 using random.org. Good Luck! Remember -- entries left in the comments do not count! I take my son to his school's open house to meet his teacher and see his class room before school starts. His school sets up booths with pizza and snacks which is fun!